Rate cuts will have a big impact on your debt portfolio. It is time, if you have not already, to change your debt investment strategy to gain from the trend. On January 15, the Reserve Bank of India (RBI) started the rate cut cycle by reducing the repo rate by 25 basis points or bps. This was after a sustained fall in inflation over the last few months and gave investors confidence that the country's economy was ready for take-off. Both equity and debt markets reacted positively to the news. Analysts say more rate cuts are on the way. Conservative estimates suggest a cumulative cut of up to 75 bps in 2015. Some say it could be more. "We expect a further 125 bps cut over the next 12 months, cumulative 150 bps in this cycle," Morgan Stanley said after the RBI's January 15 move. Whatever the figure, the fact is that rate cuts will have a big impact on your debt portfolio. It is time, if you have not already, to change your debt investment strategy to gain from the trend. We have been through a long period of high yields with 10-year government bonds trading above 8% since 2011 (barring a brief period in the first half of 2013). This is probably going to change. While low and falling yields are not good for investors who follow the hold-to-maturity strategy, those with appetite for risk can make good gains from the trend. We tell you how. There are three kinds of instruments in the fixed income space-hold-to-maturity, accrual and duration. Hold-to-maturity includes bank fixed deposits, tax-free bonds, non-convertible debentures, or NCDs, fixed maturity plans, or FMPs, and small savings schemes. Accrual is a mix of hold-to-maturity and duration strategy. It includes instruments such as short-term bond funds. Duration strategy is the most aggressive of the three. This is because one has to take a call on interest rate movements. When interest rates fall, prices of bonds with coupons (the rate of interest the issuer promises) similar to bank rates increase. Selling these in the secondary market gives good gains. Let's see how you can work with the above strategies given the current interest rate scenario. Hold-to-maturity strategy: Banks have already started cutting term deposit rates. The State Bank of India (SBI), on 5 December 2014, cut the rate on deposits with tenures of one-five years from 8.5% to 8.25%. Similarly, ICICI Bank and HDFC Bank cut rates on deposits of up to two years by 25-50 bps. As the RBI reduces the rate at which it lends to banks, the trend will continue. Small savings schemes-Public Provident Fund, National Savings Certificate, Senior Citizen Savings Scheme, Kisan Vikas Patra and Sukanya Smaridhhi Account-which are benchmarked to government bonds of similar maturity, may also start lowering rates. However, given that their benchmark rate is the average yield of government securities (g-secs) in the previous calendar year (average yield in 2014 will be used to calculate the 2015-16 rates), and 10-year g-sec yields were above 8.5% during most of 2014, there is little chance of a downward revision in their rates in the next financial year. However, if the RBI continues to reduce interest rates, yields may fall below 7.5% in 2015 (the 10-year bond is currently around 7.75%). This will lead to a cut in interest rates on small savings schemes in 2016-17. "We cannot predict now what the rates will be. They are benchmarked to the average yield on government securities in the previous year. If the benchmark falls, so will the rates," says AK Chauhan, joint director and head of department, National Savings Institute, which gives inputs to the finance ministry in designing, structuring and launching of small savings products. FMPs , close-ended funds which invest in debt papers with duration similar to their own, also follow the hold-to-maturity strategy. They buy high-yield bonds and hold them till maturity. This reduces interest rate risk and yields higher returns than what bank fixed deposits give. However, as yields fall, the hold-to-maturity strategy may not give as high a return as it was doing a year ago. Besides, FMPs have lost the tax advantage they had over bank fixed deposits over one-three years. Now, an investor has to hold debt fund investments for at least three years to avail of the indexation benefit. Else, capital gains are taxed in the same way as interest on bank deposits, that is, added to the income and taxed as per the person's tax slab. Earlier, one could avail of the indexation benefit after one year. Open-ended accrual funds: These funds follow the hold-to-maturity strategy but in an open-ended structure. They usually buy high-yield bonds and hold them till maturity. The main objective is to get high returns from accrual income, that is, coupon payments and face value, and not so much from capital appreciation. The open-ended structure allows them to gain from interest rate movements as well as high yields on bonds that keep coming in the market. In these funds, the fund manager makes a trade-off between credit risk and high yield. Usually, he buys corporate bonds with high yields but not top credit-rated. Money market instruments such as T-bills, certificates of deposits and commercial papers are also part of the portfolio. These funds usually have a short tenure (one-three years) to minimise the interest rate risk. Liquid funds, ultra short-term funds, income opportunities funds, etc, fall into this category. Duration Strategy: In this the fund manager takes active calls and changes exposure to high duration securities based on his expectation of where rates are headed. Duration of a debt security is its sensitivity to interest rate changes. The higher the duration, the higher is the change in price. A duration of five years means that for every 100 bps change in the interest rate, the price of the bond changes by 5%. So, in a market where interest rates are falling, the fund manager increases allocation to high-duration bonds/debt securities so that prices of bonds in the portfolio rise sharply, allowing him to gain from capital appreciation. The fund gains from coupon payments as well as rise in bond prices. The duration strategy could, therefore, yield good gains during periods of falling interest rates. The examples of duration funds are income funds, dynamic bond funds and gilt funds. Before investing in a duration fund, one can make a fair estimate of gains by looking at the modified duration and yield-to-maturity (YTM). Both can be found in the fund factsheet. If the YTM of a fund is 10% and its duration is five years, the likely returns if interest rates fall by 100 bps in one year will be 15%. 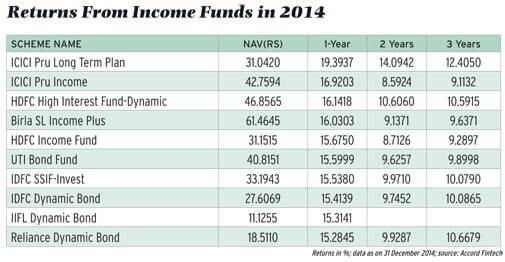 In 2014, duration funds gave high double-digit returns, some as much as 20%. If the RBI cuts interest rates by another 75-100 bps, 2015 will be no different. Accordingly, financial planners are advising investors to increase allocation to duration funds. "At the moment, yields are relatively high. Given that rate cuts are expected, investors can get accrual income as well as capital gains. We expect double-digit returns in the next 12-15 months," says Lakshmi Iyer, head of fixed income, Kotak Mutual Fund. But to make sure that the portfolio remains balanced, add liquid funds (for liquidity needs), accrual funds and other traditional fixed income products for safety and duration funds for taking advantage of the rate cut cycle. "Though the core debt portfolio should have liquid, ultra short-term, short-term income and accrual funds, we are advising investors to allocate 30-40% money to duration funds," says Amandeep Chopra, head, fixed income, UTI Mutual Fund. Bekxy Kuriakose, head of fixed income, Principal Mutual Fund, however, asks investors not to take too much exposure to duration funds as bond prices have already risen quite a bit and markets may have already priced in some of the future rate cuts. According to Vishal Dhawan, founder and chief financial planner, Plan Ahead Wealth Advisors, one can have 20% exposure to duration funds, 40% each to hold-to-maturity products and open-ended accrual funds. Though FMPs also follow the hold-to-maturity strategy, they work under restrictions such as on the maturity of debt securities they can hold because of their close-ended nature. At a time when interest rates are changing, investors should not lock in money in close-ended funds such as FMPs but instead go for funds which offer more flexibility in portfolio construction, holding period, etc. In a close-ended fund, one has to withdraw the money once the fund's tenure ends. "There are high yield securities such as NCDs and CPs also, but these are not available daily. Only open-ended funds can take advantage of these opportunities," says Kuriakose of Principal Mutual Fund. In a changing interest rate scenario, the uncertainty of returns may make you jittery, especially if you are in the 'distribution phase' of your life, that is, retired. Here, you need certainty of income and, therefore, must put most of your money in instruments which give regular income, though it may mean sacrificing some returns. "Uncertainty is not as much a concern for someone who is in the accumulation phase, but for someone who's in the distribution phase, this kind of uncertainty may not be very good," says Vishal Dhawan of Plan Ahead Wealth Advisors. Also, investors must not look at only gross returns but also consider real returns. Real returns are after-tax returns minus consumer price inflation. For example, if the tax-free return from your debt investment is 8% and the average consumer price inflation is 6.5%, your real return is 1.5%. *This story appeared in the Money Today March 2015 Issue, which hit the stands before the interest rate cut by RBI on March 4, 2015.